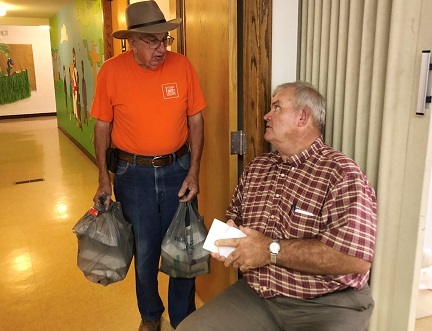 On September 15th and16th, nearly 40 members from local United Church of Christ congregations donned bright orange t-shirts for the twelfth annual Faith in Action weekend of service. Members formed teams and spent the weekend doing service projects throughout Southwestern St. Charles County and Southeastern Warren County. This annual program began in 2007 as an off-shoot of mission trips to the New Orleans area following Hurricane Katrina. What began with Hurricane Katrina continues through aid which will now be sent to those recovering from Hurricane Florence. 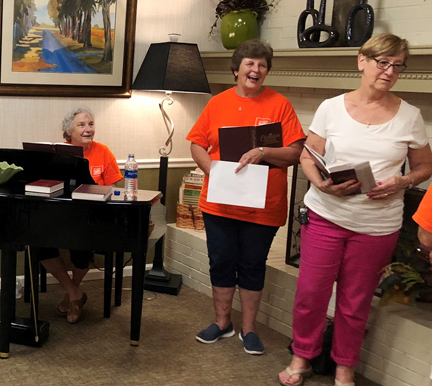 • The Hymn Sing Team made a little joyful noise. They sang old time hymns with residents at three nursing care facilities in Washington, MO. • The Odd Jobbers Team helped at Our Lady’s Inn located in Defiance, MO. The volunteers prepared lunch for the residents and staff. • The Assembly Team assembled 100 food boxes and 110 hygiene kits. The food boxes will be distributed to local food banks throughout Missouri and the hygiene kits will likely be distributed to those recovering from the recent hurricanes. 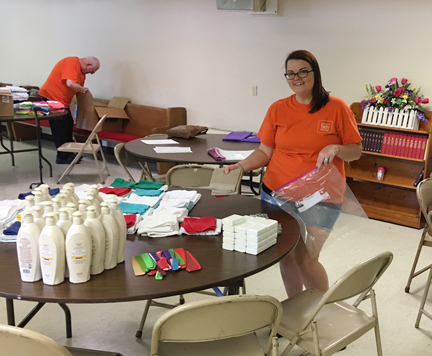 • The Helping Hands Team worked for the Emmaus Home organization. They enjoyed spending the afternoon doing craft projects at two homes in the Marthasville area. • The Meal Delivery Team hit the road to deliver 20 chicken dinners to area homebound neighbors and friends. Deliveries ranged from Defiance, through Augusta and into the Treloar and Warrenton areas. enjoy a laugh as they get ready to sing. Carl Gerdiman and Max Bade pack up meals and get ready to hit the road.